The Texas State Board of Education is moving toward removing Cesar Chavez and Thurgood Marshall from the social studies curriculum taught to its 4.7 million public school students. According to one of the six “expert reviewers” revising the 1997 curriculum, Chavez “lacks the stature, impact and overall contributions of so many others; and his open affiliation with Saul Alinsky’s movements certainly makes dubious that he is praiseworthy.” Another reviewer concluded that Marshall, a Supreme Court justice who as an attorney argued the landmark Brown vs. Board of Education case, is “not an appropriate example as a historical figure of influence.” These are not the rantings of powerless and fringe people; they are statements from those recommending a new curriculum to the full Board. And so during a week in which an African-American President’s appointee of the first Latino to the Supreme Court dominates the news, we have Texas – whose Governor spoke of “secession” earlier this year – trying to turn back social and racial progress. Texas has an elected 15-member Board of Education, seven of which are viewed as social conservatives. The Board’s panel of experts to recommend new curriculum standards reflects this conservative perspective, which could soon result in a social studies classroom in which Cesar Chavez and Thurgood Marshall are ignored but the motivational role of the Bible in the nation’s founding is highlighted. Although Cesar Chavez advocated for Texas farmworkers, conservative opposition to him in the state is primarily linked to Chavez getting his start as an organizer with the Community Services Organization, which was affiliated with Saul Alinsky’s Industrial Areas Foundation. The Texas IAF has been extremely successful over the years, and its COPS/Metro Alliance in San Antonio has often been hailed as model for enlisting Latino participation in the democratic process. But many conservatives don’t want Latinos attending public hearings or voting. This is particularly true in Texas, where increased Latino voting could soon swing the once solidly red state to blue. The last thing these conservatives want is for millions of young Latinos to learn how Cesar Chavez preached the virtues of democratic participation — and even more dangerous is the fact that Chavez was a deeply religious man whose faith motivated him to organize workers and fight injustice. What these social conservatives fear the type of faith-based activism that Texas-IAF groups have used to promote greater social justice. People of faith marched, picketed, and engaged in civil disobedience to help the farmworker cause; if the Board’s goal really were to show how religious values helped build the nation, Chavez and the UFW would be central to the curriculum. 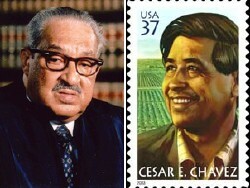 While Cesar Chavez has been under conservative attack since he launched the farmworkers movement in 1962, legendary African-American attorney and Supreme Court Justice Thurgood Marshall has rarely been viewed as a “radical.” In fact, Marshall and the NAACP practiced the “work through the system” approach that conservatives typically applaud – until, of course, it produces court rulings or elects candidates it opposes. Of course, it is Mercer’s allies who are seeking to drastically revise the social studies curriculum by removing Cesar Chavez and Thurgood Marshall. Its akin to attacks on Judge Sotomayor’s alleged “judicial activism” in the New Haven white firefighters case; it was Sotomayor and her colleagues who followed existing law, while Justice Roberts and his conservative Supreme Court allies revised the law to obtain their desired result. Although increased Latino voting will soon reduce the clout of the Texas right wing, the curriculum standards now being updated will stay in place for a decade. So unless activists and editorial boards get busy, public school students in Texas will be taught a right-wing, Christian fundamentalist perspective on United States history. While Cesar Chavez takes his lumps in Texas – and the Dallas street renaming in his honor appears dead — the Portland City Council ended a multi-year battle and voted unanimously last week to rename 39th Ave. to Cesar Chavez Blvd. The Oregonian newspaper opposed the renaming, and the “Save 39th Avenue” committee now has the option of gathering 19,335 signatures in the next 30 days to place a referendum on the name change on the ballot. Congrats to Marta Guembes and her fellow activists for waging what often appeared a hopelessly uphill fight for the renaming of a street for Cesar Chavez. Activists overcame the defeat of the first street selected for renaming, and backed the Council’s public process to find a more acceptable street. The “Si Se Puede” spirit ultimately prevailed.